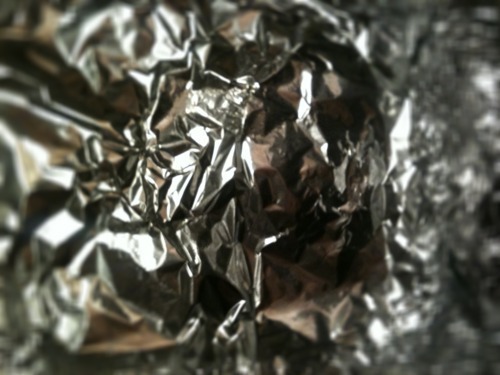 I have something to admit…I love foil! This might seem of no consequence to you but let me tell you I use this stuff to the point of obsession. I was thinking this just now as I snatched the foil box off the top of my fridge, popped it open and proceeded to lavish what is supposed to be a cookie sheet, but for today’s purposes is a baking sheet for a few thin cuts of pork loin, with a generous swath of foil. What is generous you may ask? No worries, I’m happy to share, generous is the amount of foil you actually need plus several inches on each side so, in the case of the cookie sheet one can overlap the edges insuring porkchops remain intact…well maybe that would just be my own brand of ‘special’…let’s be honest those extra few inches do not promise pork chop security rather it ensures no juice leakage. Like that? Juice leakage, that sounds friggin nasty but you feel me, all those savory liquids that emerge from the meat upon cooking do not slide under the edges of the foil thus creating the mess I’m trying to avoid by using said foil. Avoiding mess and insulating/moisturizing oven cooked meats are my prime reasons for using foil allll the time. 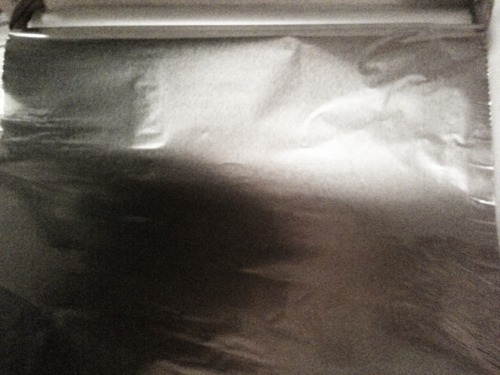 I thought I liked putting foil on the grill until I realized once used you have to painstakingly peel off every little scrap of foil; that same hardiness I can appreciate to avoid a mess in my indoors kitchen doesn’t quite translate to outdoors cooking. I guess foil is great for covering things too, like leftovers, but for whatever reason this fact doesn’t excite me as much as clean pans. Shoot in college I’m sure we found more interesting and recreational ways to utilize foil, which if you have to ask means you were better than I or participating in far more sinister activities that foil would be incapable of handling. I wonder, how much foil do I use in any given year? It would be nice to know but I am of the MTV generation as they used to call us Gen Xers so that was a fleeting thought whose thread I don’t wish to follow. In summary, I love everything about foil: the color, the heft of a regular roll (sidenote: I don’t particulary care for heavy duty foil), the packaging (I’m stuck on Reynolds, who knows why, perhaps Don Draper could riddle me that), the grunt work it does, the dishwashing it helps me avoid, the way it can be used for crafting and the most satisfying sound it makes as it rips through those jagged metal-like teeth reminding me of the crazy machine that ate people in one of those Steven King novels. I guess the Steven King reference wasn’t needed but I love my stream-of-consciousness so it wouldn’t be fair to leave that out. Next PostNext My Trainer Tried to Kill Me Today! aka Getting my Beyonce Back!